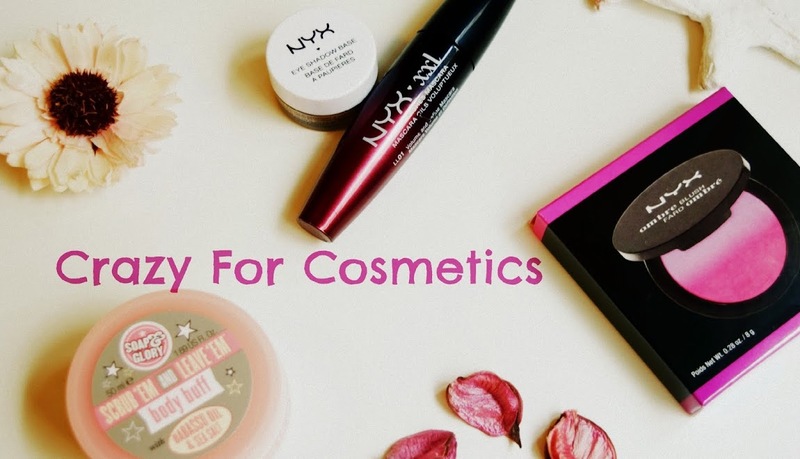 Water, sodium laureth sulfate, cocamidopropyl betaine, butylene/ethylene copolymer, xanthan gum, perfume, PEG 8, sodium chloride, hydroxypropyl guar, DMDM hydantoin, tetrasodium edta, kaolin, citric acid, benzophenone 4, methylchloroisothiazolinone, methylisothiazolinone, sodium bicarbonate, magnesium sulfate, potassium chloride, Cl 42090, Cl 60730. 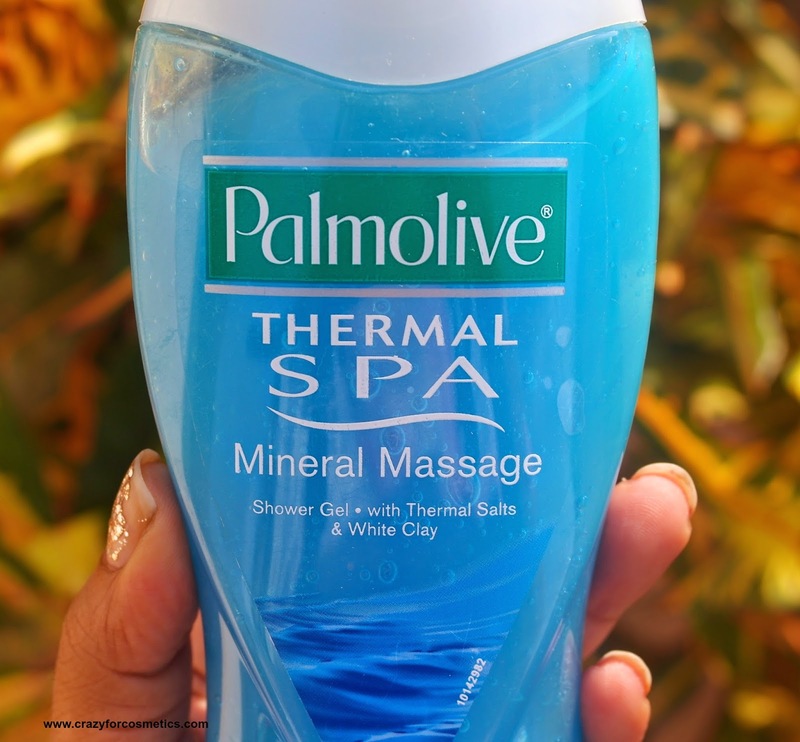 Pour a little Palmolive Thermal spa shower gel on your wet loofah. 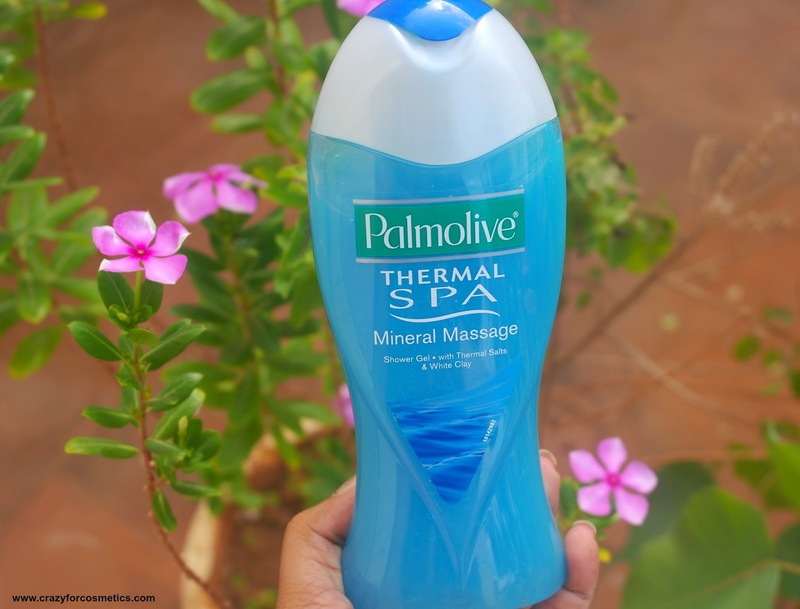 Apply gently over your wet skin. For best results, use loofah to work up rich, fragrant lather before rinsing off. 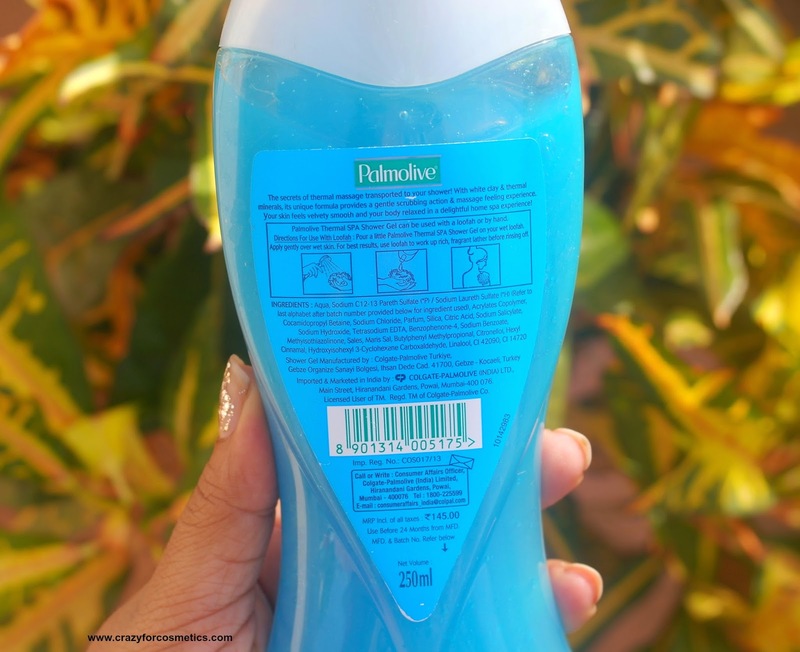 The shower gel is packed in a cute plastic container that is quite sturdy and light weight at the same time.It isn't the usual boring packaging and the liquid is visible through the transparent container.The Palmolive Thermal Spa Mineral massage shower gel is in cool minty blue shade and has a strong fragrance that reminds me of a mix of Liril Fresh soap and Sunsilk black shampoo. 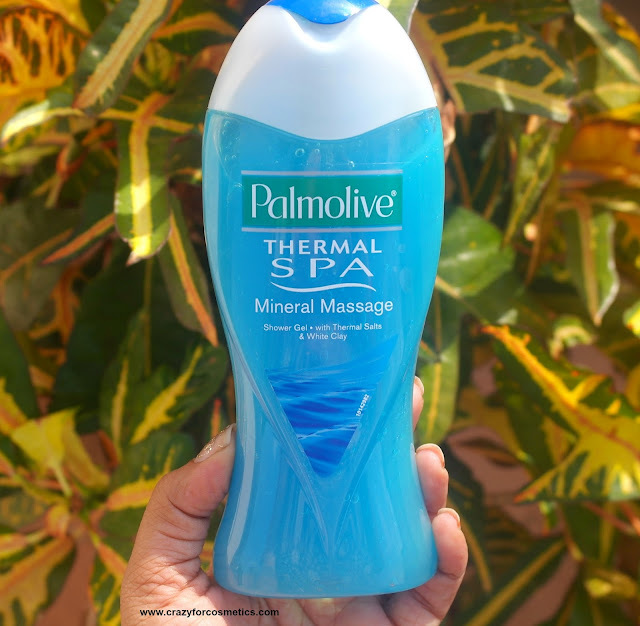 The Palmolive Thermal Spa Mineral massage shower gel is neither too runny for us to be worried about spillage nor too thick that refrains from being removed easily.It is more inclined towards medium,creamy consistency and can be used with a loofah or with hands.It lathers really well with loofah like any other shower gel and the lather is pretty decent even with hands which really impressed me when compared to other body wash/shower gel. The lather gets easily washed off unlike some which sticks to your body giving you a sticky feel. 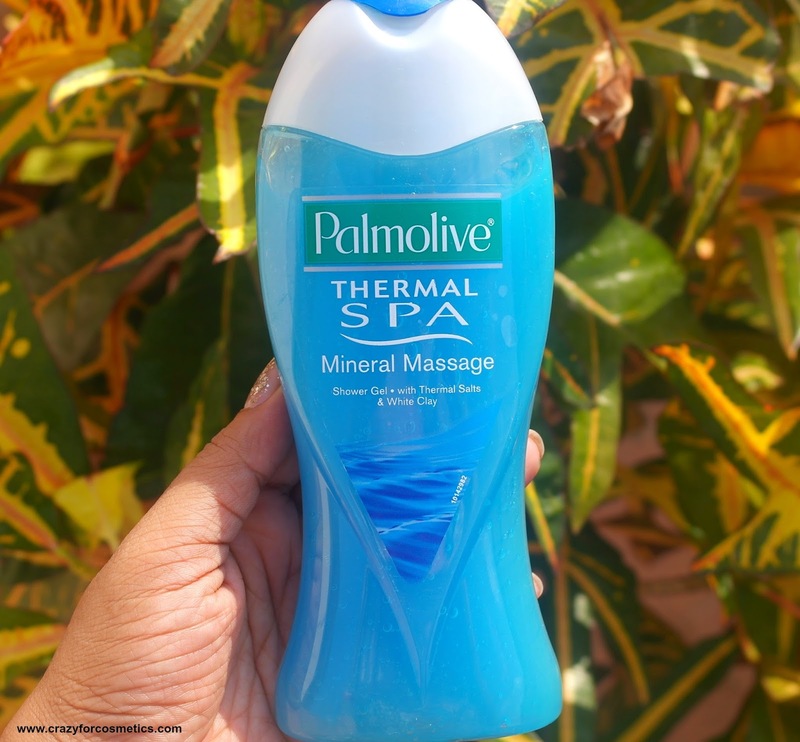 The shower gel has minute thermal salts that provide some exfoliation to the skin. The exfoliation action is very mild and hence the shower gel can be used on a daily basis. 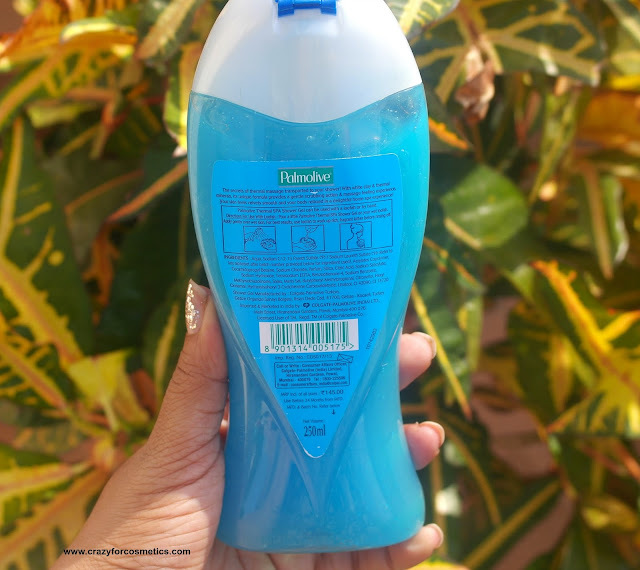 The shower gel also gives a soothing and calming effect post shower and it can be used in conjunction with a few drops of Lavender oil in our bath tub or water. It leaves my skin smooth, supple, squeaky clean and I feel fresh & energized after bath. Since it has clay in it, it drains the moisture from my skin and makes it a bit dry. I need to follow it up with a body butter or moisturizer for sure. It can be used by both men & women and is such a worthy buy at the price paid.It is priced at INR 145 for 250 ml and it will last for a month at least(using twice daily) since you need only 2 pea sized drops for your whole body while using the loofah. 5 : Suitable for normal skin/oily skin. 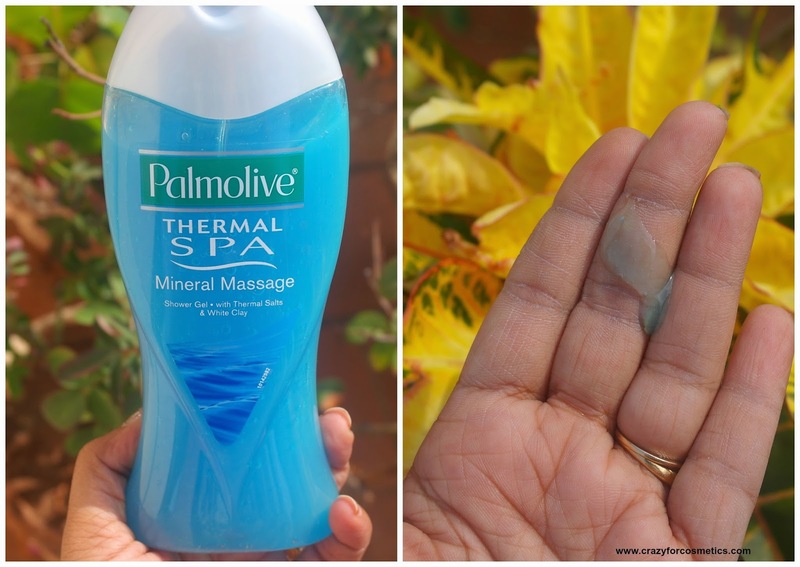 6 : Makes skin soft & supple by providing minor exfoliation. 8 : Perfect consistency & easy to wash off. 2 : Smell can be a bit over powering for some.